On this year’s road trip, our highest one-day mileage was a mere 600 miles, way below our record road trip total of just under 1000 miles on the last day of our epic Seattle to New Orleans and back again odyssey in 2010. That day was a one-time stroke of let’s-just-get-home-no-matter-how-long-it-takes madness never to be repeated. The least amount of miles we covered this time in one day was close to zero when we spent one whole day in Billings, Montana. 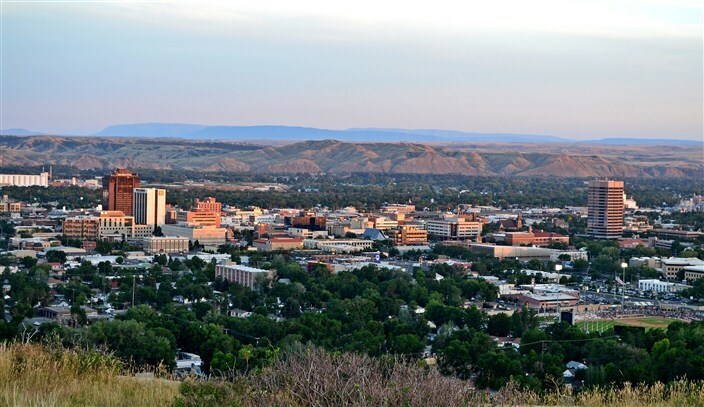 Some might ask, why would you spend an entire day in Billings? A fair question. It’s not the most picturesque city in the state, but it’s far from the worst. 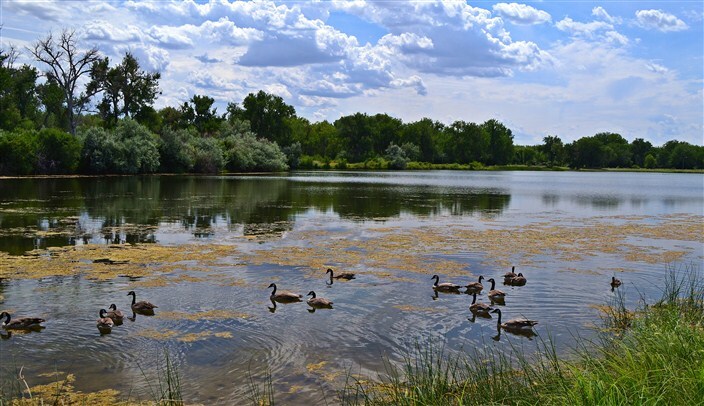 That dubious honor would surely fall to Butte, a tattered and battered old wreck of a town whose better days – or at any rate, more prosperous days – came more than a century ago. Nowadays, to call it run down would be a compliment. More like run over. 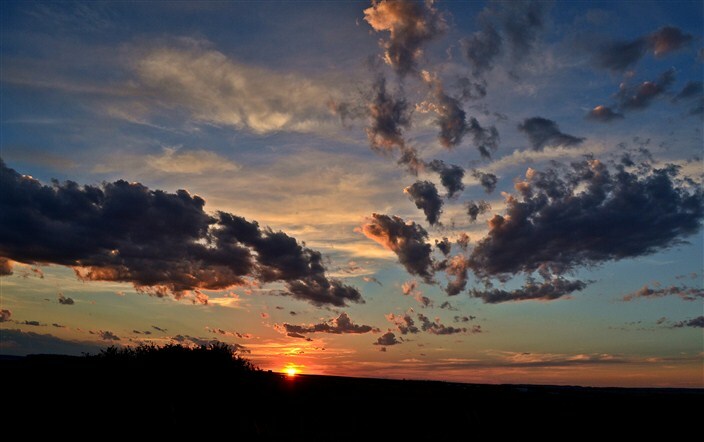 We spent the extra day in Billings for two reasons, really. One, to relax, walk and stretch our car-cramped bodies after three days of nearly constant driving. And, two, to check out the city as a possible retirement location. The first part was accomplished quite well; the second…well, let’s say the jury is still out on that idea. It’s a nice enough place and a good compromise in terms of size: big enough to feel urban and offer most of the things a city has to offer, but not a huge, sprawling megalopolis blighted with all the typical ills associated with such places. For me, big cities are fine for visiting on day trips but I could never live smack in the middle of one. 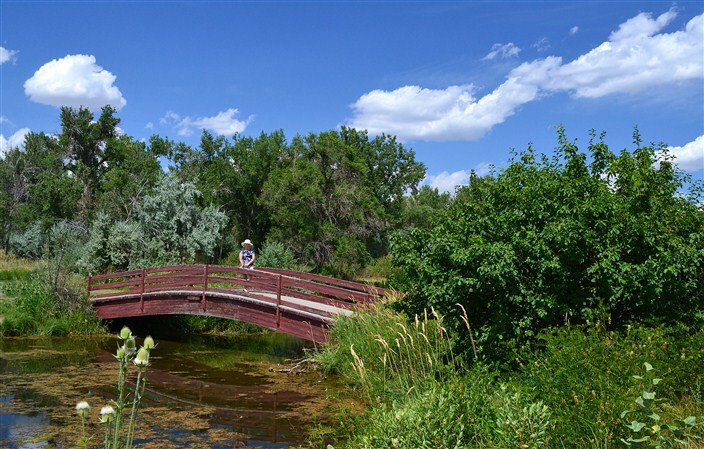 One of the attractive things to us about Billings is the concept of four distinct seasons with lots of sunshine year-round. Our home region of western Washington state offers lots of natural beauty and greenery to go with all the gray skies, but it’s never going to be accused of having too much sunshine. So the idea of 300 days of sun scattered year-round and not all crammed into two, or at best three, months has some real merit, with the added bonus of the afore-mentioned true four seasons. 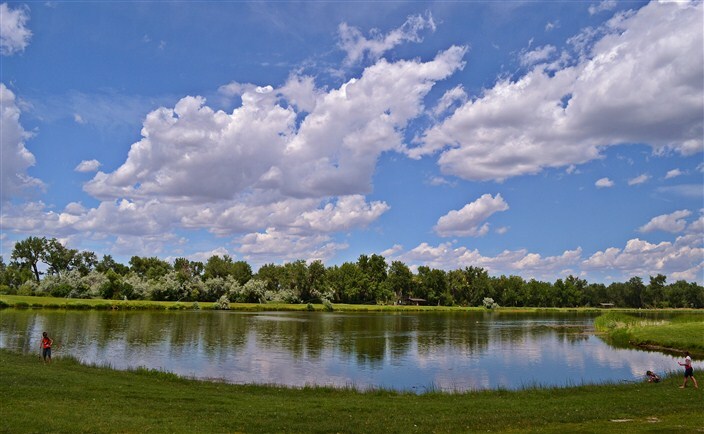 Billings is also more affordable than a lot of similarly-sized cities boasting of the same year-round sunny climate. 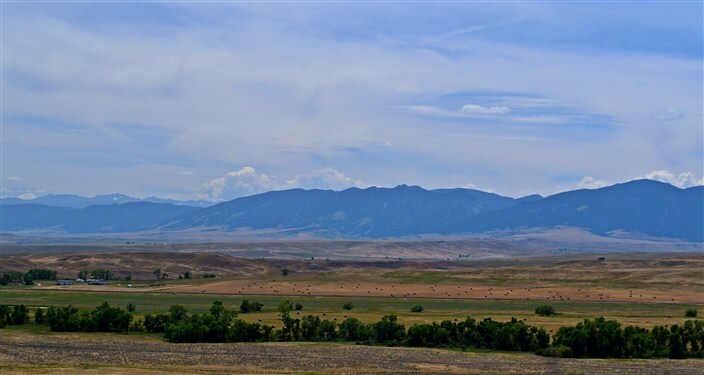 And I like the whole Montana, western ethos, a little rough, not too tame and citified, slower paced, uncrowded and on the whole more conservative – and I don’t mean just politically. If you’re driving the interstate heading east from Billings you have a choice a few miles east of town where the road splits: take I-94 northeast through eastern Montana and North Dakota, or I-90 south into the northeast corner of Wyoming and then into South Dakota. We opted for the latter as our final eastward destination was Mount Rushmore, the Black Hills, and the Badlands of South Dakota. 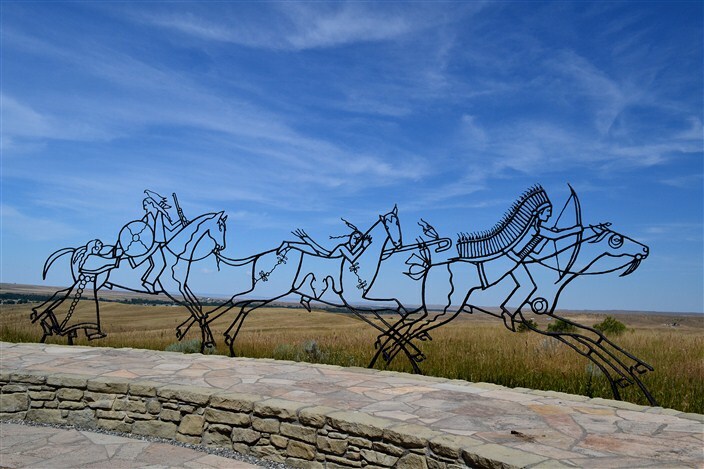 Before getting there we had other stops to make along the way, the first significant one of these being the Little Bighorn Battlefield National Monument. 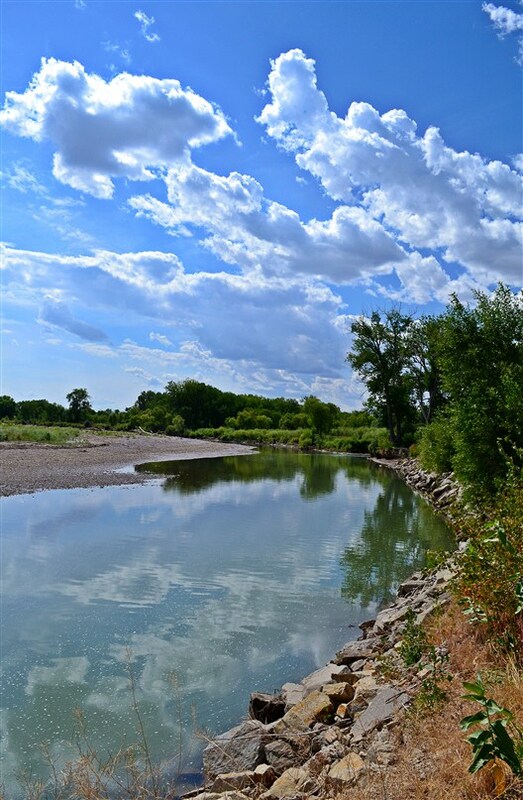 The battlefield is easily accessed, lying less than a mile from I-90. One hundred thirty eight years after the 1876 Battle of the Little Bighorn, George Armstrong Custer remains one of the most divisive, elusive figures in all of American history, an enigma who is both revered and reviled despite the innumerable books and exhaustive research about him and the battle itself. Was he a brash and bold military genius who made a series of miscalculations that proved fatal, or was he a lying, black-hearted Indian killer who finally got what he deserved? I personally think a good case can be made for the truth residing somewhere in the middle. 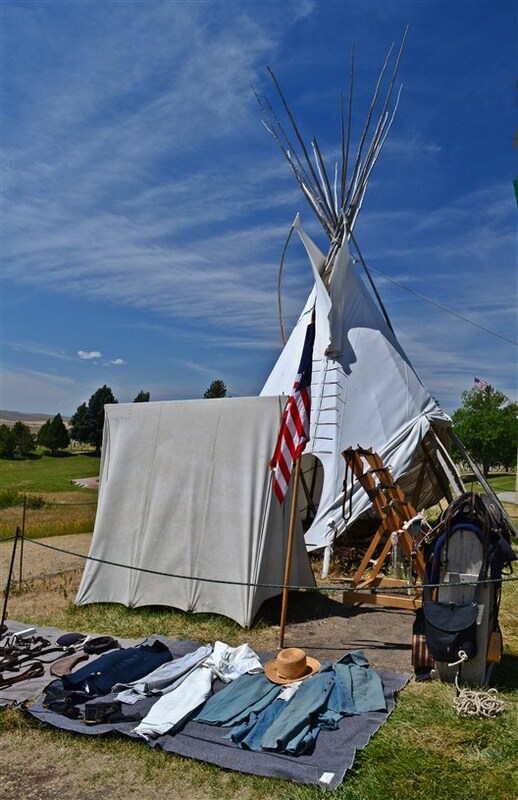 Whatever side of the argument you fall on regarding Custer himself, a visit to the Little Bighorn Battlefield is an absolute necessity for anyone with even the remotest interest in the great saga of the American west. It’s no exaggeration to say this battle was both the climax and turning point of the long clash between Manifest Destiny and the American Plains Indian tribes. 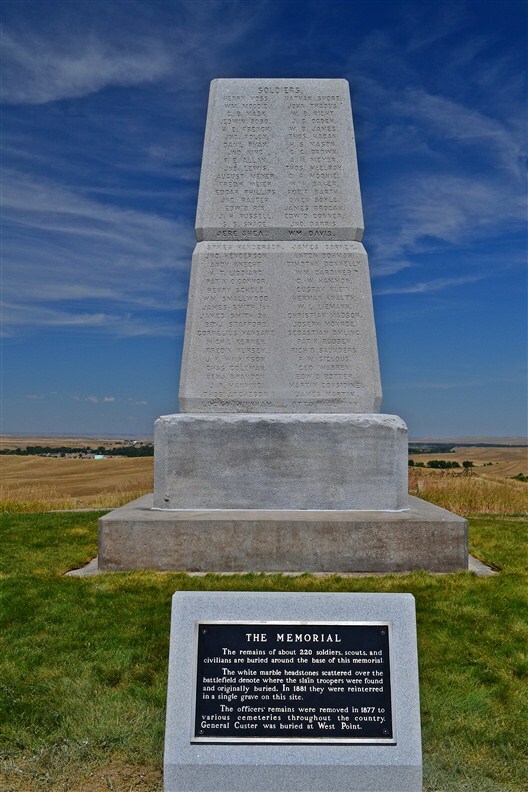 The great irony of the Battle of the Little Bighorn is, of course, that it was the Indian’s greatest victory in their decades-long struggle to retain their place on the open plains of the west, and yet that victory led directly to their ultimate defeat and loss of their lands. 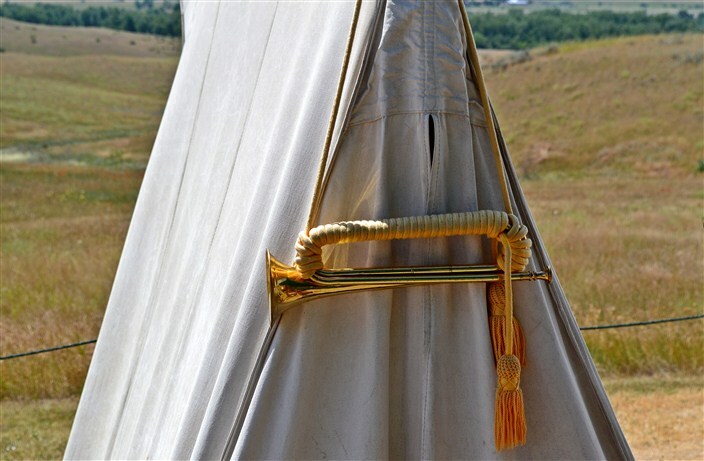 If not for the Little Bighorn and the annihilation of Custer and all his men, and the subsequent national outrage and furor it created, there might not have been the concerted military effort which soon followed to finish the job of pushing the remaining Indian tribes onto the reservations. Within a few years of Custer’s defeat, there was effectively no armed Indian resistance left in the West. As is the case with most former battlefields, visiting the site of the battle now is a sobering, haunting experience. 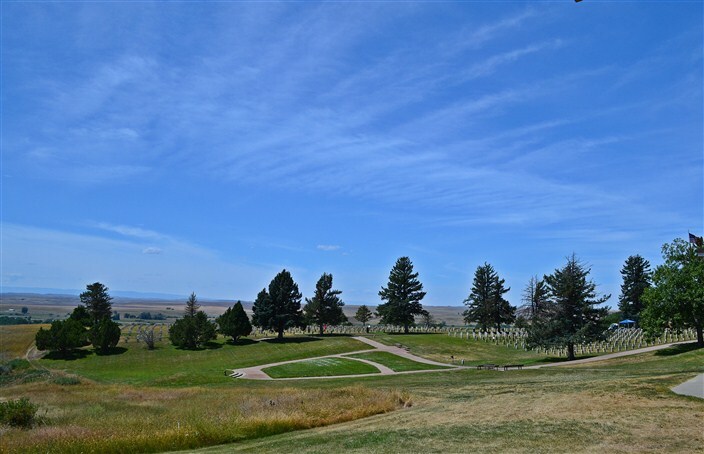 Set among rolling hills in the grasslands of southeastern Montana, which would be completely unremarkable and indistinguishable from the rest of the surrounding landscape if not for what happened here on the fateful day of June 25, 1876, the grounds house a modest-sized visitor’s center and also a national military cemetery. 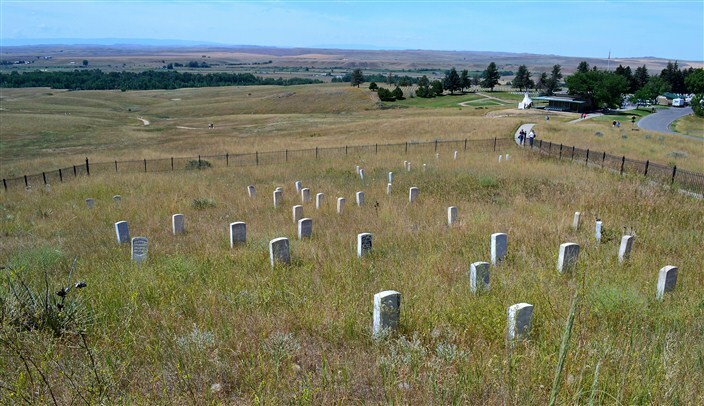 This cemetery holds no direct relation to the Little Bighorn battle itself, but is the final resting place for veterans of American wars reaching all the way back to the Spanish-American War of 1899 up to Vietnam. The visitor center houses a great deal of information, including a timeline of events leading up to and following the battle. There are also a number of artifacts from many of the participants including weapons and personal effects and many stories from the only survivors of the conflict, the Indian warriors who prevailed. 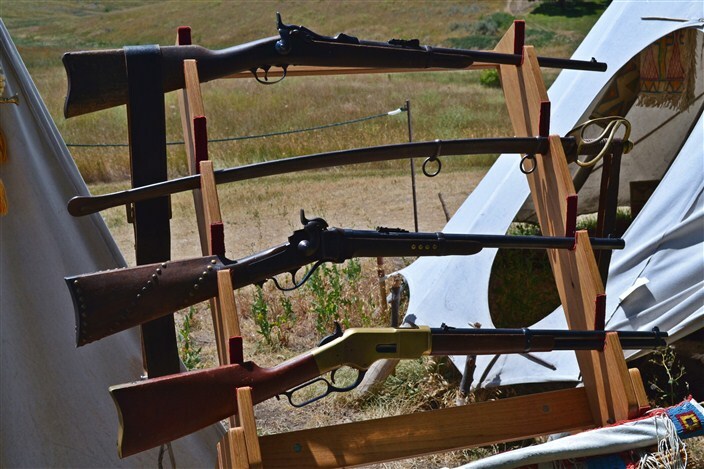 As no one under Custer’s direct command lived, historians have had to rely on these conflicting and even contradictory accounts ever since the smoke of battle cleared. Perhaps this is the greatest appeal of the story and why it has persisted so strongly in the national consciousness. 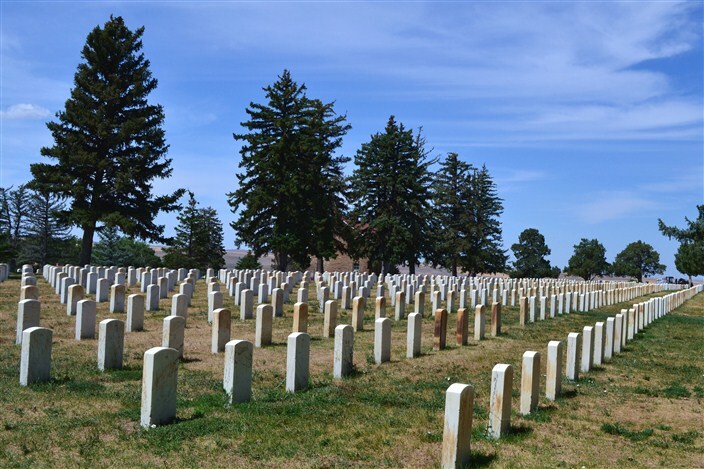 No one really knows exactly what happened that day to Custer and his men, what their final moments held or why Custer made the decisions he made to split his forces and to seemingly charge headlong into a suicidal attack against a much larger force. And so the legend lives on, mythologized out of all proportion to its military significance, forever a part of American western folklore. We spent a couple of hours wandering around the grounds but you could easily spend the entire day if you want to visit all the sites of the battle, which was actually a series of smaller running battles and encounters spread across several miles of differing terrain. 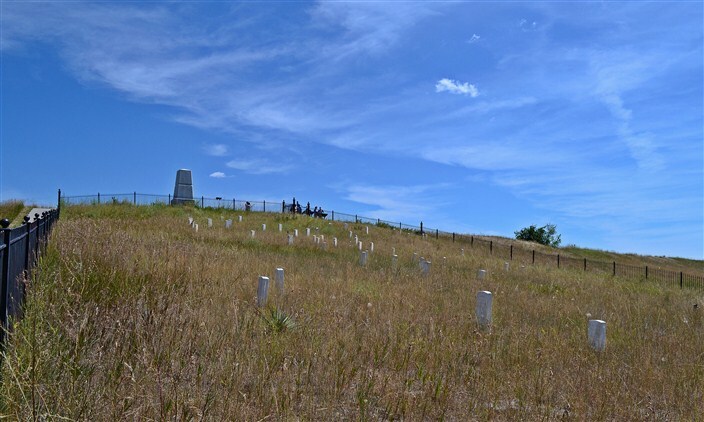 Last Stand Hill is, of course, the center of attraction for most people, the famed location where Custer and the last forty of his men “died with their boots on,” surrounded by hundreds of Indian warriors. 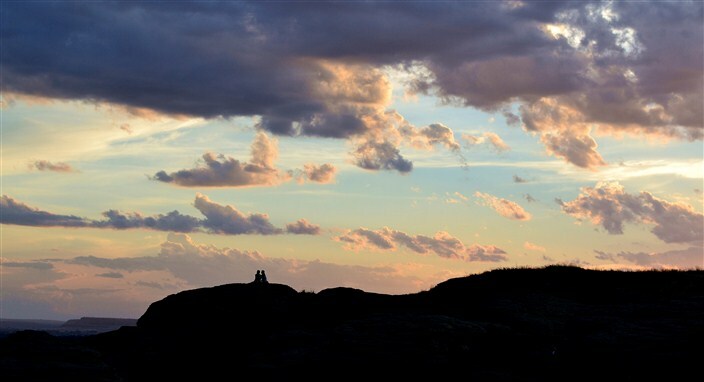 The hill is surmounted by a large, white granite memorial engraved with the names of all the 7th Cavalry soldiers who died on the battlefield. Headstones dot the hillside approximating the locations where the soldiers fell and were hastily buried the day after the battle. Custer’s remains were taken to West Point and re-interred some years afterward. Other officers were taken to various other sites, while most of the enlisted men’s remains lie beneath the memorial at the top of the hill. Thanks for stopping by, Craig. I checked out your site and read the first article on your NOLA trip, nice. We did a Seattle to NOLA trip back in 2010, you can read it all here under the heading All-American Road Trip 2010 – enjoy!